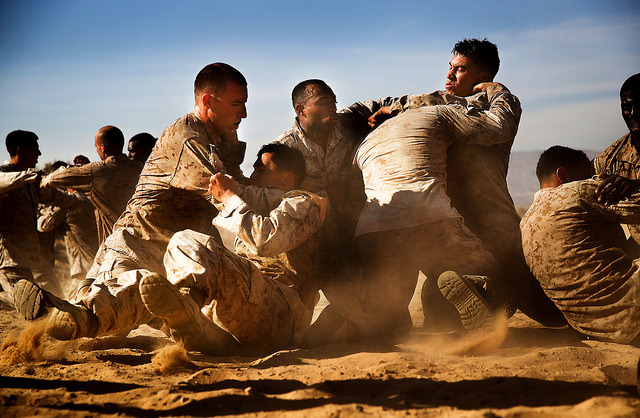 Image courtesy of Flikr user Marines. The US Marine Corps’ doctrinal conceptualization of warfare (HQMC, 1997) is inherently psychological and therefore understanding the human cognitive, psychological, and physical limits with respect to combat are essential and identifying these limits should be the sine quo non of military psychology. Combatants must confront chance, uncertainty, friction (Mattis, 2008), volatility (Laurence, 2011), and urgency (Zaccarro et al, 1995) while contending with existential threats. Combat is a fundamentally uncertain form of competition (Boyd, 1976) where consequential decisions are often based on incomplete, inaccurate, or even contradictory information (HQMC, 1997), and thus decision-making is the principal human factor in warfare (Krulak, 1999). Boyd’s Observation, Orientation, Decision, Action (OODA) Loop (or Boyd Cycle) is not an answer to the question at hand, but it provides a means of investigating human cognitive, psychological, and physical limits as they relate to tactical decision-making. Bryant (2006) and Benson & Rotkoff (2011) were correct that Boyd’s model was not the result of psychological theory; however, the OODA Loop can be synthesized with the neural process model of automatic multi-structure controlled social cognition, the X and C systems, (Lieberman et al., 2003) as well as Baddeley’s (2003) working memory model to provide a neuroanatomical and cognitive reference point to the original. The combination of the model and those reference points provides us with an appropriate framework through which to describe and address the question at hand. Boyd’s model (Figure 1) is centered on “Orientation”, the hub upon which the other elements rotate (Richards, 2012) and includes the complex filtered arrangement that analyzes and synthesizes new information, along with genetic heritage, cultural predisposition, and complex system of memory that comprise an individual’s cognitive apparatus. The interaction amongst these elements is enabled by working memory (Matthews, 2013) and as such working memory is the limiting reagent. “Orientation” is the first source of uncertainty in decision-making as “Observations” may be ambiguous, “New Information” is susceptible to misinterpretation, and the effect of implemented “Decisions” may be unclear. Lieberman and colleagues (2003) have suggested that these interactions are mediated by neuroanatomical systems in the brain. The X-system (lateral temporal cortex, amygdala, and basal ganglia) holistically and unconsciously integrates current goals, context, and perceptions to direct consciousness and current behavior while the C-system (prefrontal cortex (PFC), anterior cingulate cortex (ACC), and medial temporal lobes), reallocates cognitive resources to the immediate priority (Lieberman et al., 2003). Critically, regions of the C-System have been implicated in the storage, manipulation, and resolution of ambiguity and uncertainty during decision-making (Huettel et al, 2005; Goel et al, 2007). Meanwhile, working memory supports “Orientation” subcomponents. For instance, the central executive, represented by the doubled-sided arrow between “New Information” and “Analysis/Synthesis”, and the episodic buffer, represented by the doubled-sided arrow between “Previous Experience” and “New Information”, are most explicitly stressed during situations of high mental workload (Baddeley, 2003). During “Analysis/Synthesis”, the C-system can integrate and synchronize numerous bits of information (Lieberman et al., 2003). The X-system depends primarily on the associative links formed through “Past Experience”, whereas the C-system constructs novel associations through “Analysis/Synthesis” (Lieberman et al., 2003). It is perhaps simplistic to suggest the limit of “Orientation” is generalized fluid intelligence, but that is a reasonsable research hypothesis. Figure 1. The Boyd Cycle or OODA Loop (adapted from Richards, 2012). “Orientation” shapes “Observation”, “Decision”, and “Action”, and in turn is shaped by the “Feed Forward” from the sensory information assimilated during “Observation” (Osinga, 2006). The transition from “Observation” to the “New Information”, within “Orientation”, activates the X-System where it employs parallel input networks to integrate “Outside Information” from multiple sources (Lieberman et al., 2003). The limits of “Observation” are both the types and amount of sensory information individuals can process, a topic that provides rich research opportunities (CAFTDHPM, 2012). “Decision” a form of problem solving (Fletcher, 2004) that reviews alternatives and selects the preferred course of “Action” in highly complex environments (Grier, 2012). “Decision” involves the C-System, which is activated when the X-System fail to generate coherent “Decision” based on the set of observations (Lieberman et al., 2003). “Decisions” are monitored by the ACC and, if required, signals the PFC that a conflict has been detected, requiring conscious attention and cognitive resource allocation to working memory (Goel et al, 2007), the “Feedback” from “Decisions” to “Orientation” via “Observation”. “Decisions” are highly contextual and thus not entirely cognitive, therefore identifying limits may not be an intrinsically psychological question. “Action” checks the selected “Decision” through implementation, or “Test”. Selecting an “Action” in the face on unanticipated “Outside Information or “New Information” relies upon regions within the C-System (Lieberman et al., 2003), the rapid “Feed Forward” from “Observation” through “Orientation” to “Action”. The limit of “Action” is tactical ingenuity; something that has proven vast under fire (HQMC, 2011) and should thus be continually encouraged and developed. Boyd (1987) advocated isolating adversaries by manipulating their “Orientation” through inducing “Unfolding Circumstances” that trigger the human stress response; novelty, unpredictability, threat to survival, and perceived lack of control (Lupien, 2009). Boyd’s insight should not only continue to be integrated into campaign plans but also on training and leadership development. Developing the capacity for intuitive decision-making is neither simple nor insignificant and continued research is required to improve understanding of where the human cognitive, psychological, physical limits lie. Identifying these limits should be a research priority for military psychology and, as Boyd recommended, “Orientation” should be the focus. Military psychology is the conduct of research or practice of psychological principles within a military environment (Kennedy & Zilmer, 2012). The field is defined by the domain of application and not a common theoretical framework or set of proscribed practices (Kennedy & Zilmer, 2012). Operational psychology, which is related to but distinct from military psychology, is a field that supports the employment and/or sustainment of personnel to achieve military, intelligence, or law enforcement objectives by leveraging and applying psychological expertise (Kennedy & Williams, 2011). Operational psychology, while broad in scope, places greater emphasis on emphases on human factors within complex social systems than hardware systems (Windle & Vallance, 1964) differentiating the discipline from engineering psychology. Operational psychology can be the bridge between the laboratory and the battlefield while tactical psychology, a subset of operational psychology, concentrates on how individuals behave when they are in direct contact with an enemy (Murray, 2013). Working memory has four main components: the central executive, the phonological or articulatory loop, the visuospatial sketchpad, and the episodic buffer (Baddeley, 2003). The phonological loop processes auditory information and consists of temporary auditory storage (Baddeley, 2003). The visuospatial sketchpad performs temporary storage and manipulation of visual information (Baddeley, 2003). The central executive integrates and deconflicts cognitive resources during parallel tasks, temporarily stores and manipulates long-term memory, alters those storage and manipulation strategies, and provides selective attention to novel stimuli (Baddeley, 2003). Controlled by the central executive, the episodic buffer integrates information from the phonological loop and visuospatial sketchpad (as units of visual, spatial, and verbal information) with appropriate temporal information to facilitate the link between short-term and long-term memory (Baddeley, 2003). Baddeley, A. (2003). Working Memory: Looking Back and Looking Forward. Nature, 4, 829- 839. Benson, K. & Rotkoff, S. (2011). Goodbye, OODA Loop. Armed Forces Journal. http://www.armedforcesjournal.com/2011/10/6777464. Accessed 10/22/11. Boyd, J.R. (1976). Destruction and Creation. http://pogoarchives.org/m/dni/john_boyd_compendium/destruction_and_creation.pdf. Accessed 11/25/2013. Boyd, J.R. (1987). The Strategic Game of ? and ?. http://www.dnipogo.org/boyd/pdf/strategy.pdf. Accessed 7/5/14. Committee on Assessing Foreign Technology Development in Human Performance Modification. (2012). Human Performance Modification: Review of Worldwide Research with a View to the Future. Washington, DC: The National Academy Press. Fletcher, J. D. (2004). Cognitive readiness: Preparing for the unexpected (No. IDA-D-3061). I Alexandria, VA: Institute For Defense Analyses. Goel, V., Tierney, M., Sheesley, L., Bartolo, A., Vartanian, O., & Grafman, J. (2007). Hemispheric specialization in human prefrontal cortex for resolving certain and uncertain inferences. Cerebral Cortex, 17(10), 2245-2250. Grier, R. A. (2012). Military Cognitive Readiness at the Operational and Strategic Levels A Theoretical Model for Measurement Development. Journal of Cognitive Engineering and Decision Making, 6(4), 358-392. Headquarters, Marine Corps. (1997). MCDP 1: Warfighting. Washington, DC: United States Marine Corps. Headquarters, Marine Corps. (2011). US Marine Corps Small Unit Decision Making Workshop Final Report. Quantico, VA: US Marine Corps Training and Education Command. Huettel, S.A., Song, A.W., & McCarthy, G. (2005). Decisions under Uncertainty: Probabilistic Context Influences Activation of Prefrontal and Parietal Cortices. Journal of Neuroscience, 25(13), 3304 –3311. Kennedy, C. H., & Williams, T. J. (Eds) (2011). Ethical practice in operational psychology: Military and national intelligence applications. Washington, DC: American psychological association. Kennedy, C.H.& Zilmer, E.A. (Eds) (2012). Military psychology: Clinical and operational applications. New York: Guilford Press. Krulak, C. C. (1999). Cultivating intuitive decisionmaking. Marine Corps Gazette, 83, 18-22. Laurence, J. H. (2011). Military leadership and the complexity of combat and culture. Military Psychology, 23(5), 489-501. Lieberman, M.D. ; Schreiber, D., & Ochsner, K.N. (2003). Is Political Cognition like Riding a Bicycle? How Cognitive Neuroscience Can Inform Research on Political Thinking Political Psychology. Special Issue: Neuroscientific Contributions to Political Psychology, 24(4), 681-704. Lupien, S. J. (2009). Brains under stress. Canadian Journal of Psychiatry, 54, 4-5. Matthews, M. D. (2013). Head Strong: How Psychology is Revolutionizing War. Oxford: Oxford University Press. Mattis, J. N. (2008). USJFCOM Commander’s Guidance for Effects-based Operations. Joint Forces Quarterly, 51(4), 105-108. Murray, L. (2013). Brains and Bullets: How Psychology Wins War. London: Biteback. Osinga, F.P.B. (2006). Science, Strategy, and War: The Strategic Theory of John Boyd. New York: Routledge. Richards, C. (2012). Boyd’s OODA Loop (It’s Not What You Think). https://fasttransients.files.wordpress.com/2012/03/boydsrealooda_loop.pdf. Accessed 1/25/14. Scales, R. H. (2009). Clausewitz and World War IV. Military Psychology. 21:(Suppl. 1) S23–S35, DOI: 10.1080/08995600802554541. Williams, E., Abarbanel, Brenner, M., Despain, A., Drell, S., Dyson, F., Joyce, G., Lewis, N., Press, W., Vesecky, J., & Woodin, H. (2008). Human Performance. Washington, DC: Office of Defense Research and Engineering (ODDR&E). Windle, C., & Vallance, T. R. (1964). The future of military psychology: Paramilitary psychology. American Psychologist, 19(2), 119-129. Zaccaro, S. J., Gualtieri, J., & Minionis, D. (1995). Task cohesion as a facilitator of team decision making under temporal urgency. Military Psychology, 7(2), 77-93. NextEssay Campaign #15: Geography, Demographics, and Strategy – Blessing or Curse?